It’s so easy to say. We can make so many ‘when’ resolutions that we end up constantly living in the future and not cherishing what we have now. I used to be like this a lot, it was always about the ‘when’s’, I promised myself, “When I get a good job, I’ll start saving” – but when I got a job I started spending more! I said “When I get a boyfriend I will feel secure and happy”, but I only got more insecure and more unhappy! I said “When I move to Japan I will start eating healthily”, but when I got here I didn’t know my udon from my soba, so I just ate whatever I could lay my hands on! I was forever living in the future, and not taking care of what I had, then and there. I was constantly living for the next big thing to happen to me, to make a change in my life. I could have easily started saving just a bit of money, I could have placed my security and joy in God rather than a boyfriend, I could have started eating healthily, but instead I decided to wait for the when! Sometimes the ‘when‘ never happens… Or if it does, it doesn’t turn out how we expect and we are left disappointed! We make vows to make ourselves feel better, in a hope that what we long for will come to us, and what we really, really want will just fall straight into our laps. We feel we don’t deserve it so we try and justify our desires by placing ‘if’ and ‘when’s‘ in front of them! But sometimes we need to remember, God wants to fulfill us and give us what we need, he does want to satisfy the deepest desires of our hearts. But first he wants us to take a look at what’s in our hands now. He wants us to be faithful in what we have now. When we are faithful in the small things God is going to give us the big things, but he needs to know we are ready! I was forever making “when” ultimatums for myself or trying to push forward in my own plan! But I didn’t need to depend on all the when’s in my life for happiness! I need to depend on God and trust that he will give me the ‘big things’. I don’t need to go shopping for them myself. We can be happy with what we have now, make the most of it, learn new skills, be thankful and live with a great attitude, preparing our hearts for what God really longs to give us! God IS going to lift us up, but the question is are we ready? We all have a part in it!! Japan is a crazy place, sometimes there are so many weird and wonderful things going on here! Everyday never ceases to amaze me! 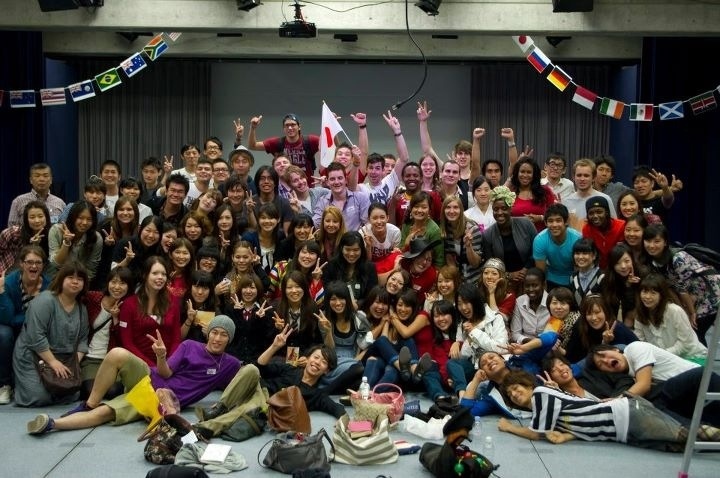 But the best thing about Japan, us by far, without a shadow of a doubt – the people! everyone is different, unique, intricate and wonderfully made! I love the people of Japan! I love talking to people I meet on the street, people at school, people lost looking for directions, junior high school kids wanting to practice their english. From the girl who runs on the treadmill next to me, at the gym, to the woman who sells me my onigiri every day, they all have a different story, some hard, some tough, some incredibly heart wrenching – but all of them have one thing in common, their lives can be changed! I want to see their lives transformed, to be given the opportunity to be lifted out of the situations that are holding them down, to be able to live with passion, vision and be filled with more love than they could imagine possible! That all starts with one thing, Jesus! But most of them have never heard of Jesus… that however, is changing. This weekend our church baptized 4 beautiful girls who had their lives changed by meeting Jesus! They all told their stories of how they had gone from shy, quiet girls – to confident women filled with passion and vision! They talked about how their passion for Jesus and for life had been rekindled and that they could have a real relationship with God – a relationship leading to a better future and towards the plan they all believe God has for them! These girls were shining, happy and glowing with Gods love! All of them were so thankful to our church, Jesus Life house and Life group leaders who had encouraged them to grow and grab hold of their lives and start living for Jesus! All of them so happy their lives had been transformed! Jesus Lifehouse has seen people who have gone from hating themselves, from depression, from being at the point of ending their lives – too finding a life full of hope, love, vision and joy, with Jesus at the centre! Japan is at a time of change and that means people’s lives can change too! We are where it starts, I’m so excited to see more people meet Jesus, hear about how amazing He is and receive His love for the first time! We can be a part of it! It all starts with the people around us in our everyday life. The person you sit next to on the train everyday, the check out girl at the conbini, the woman who does your hair, your Japanese teacher, your students, you friends, the people on the street! There are thousands of people in Japan who if they heard about Jesus would say they want in! After all who would say no to being offered the best life possible! We can help people find answers and healing in Jesus! We all have a part in it! These everyday people, all have things going on in their lives, a lot of them haven’t met Jesus – but through us they can! When you hear that word, what do you think? I know a lot of people cringe at the thought of it. Let alone going to it. Why would I want to go to church, be judged, be put in my place, have a load of old people tell me I messed up big time. Why would I want to spend my day off going to a place like that. Other people are anti-church maybe they think, it’s just a place full of religious phonies, who are out to exploit you and take your money. Then there are those who don’t really have any opinion of the church, they just imagine it’s a bit of a boring place, where loads of old people gather and sing a few songs, it’s nice for Christmas and Easter but I wouldn’t want to go there every week. Or maybe it’s just this… a nice building. There are so many different opinions of church and what it is, what it’s about. A lot of our opinions can be swayed by other’s opinions or bad stories we have heard, or bad experiences we have had. But I want to encourage you to just take the time to really think what do you feel when you hear the word ‘church’? This weekend I had a long chat with my mum about church. She reminded me that not so long ago I had a very negative attitude towards church. I believed that the church was full of people who judged you, a place where people took you at face value and didn’t want to open their mind to who you could be. I believed it to be full of fakes, who weren’t genuinely welcoming and would judge me for who I am. Ok so I had, had a few bad experiences at university. I had tried to go to a new church with some of my non-Christian friends but instead of being welcomed I had been ignored at the back of the room, everyone was too busy to take any notice of us, and no one tried to be our friend or make us feel welcome. After that other Christians from the church that went to my university started questioning my Christianity, making me feel unworthy of the right to be a Christian. I had never met such confrontation and for someone who was finding that life not being a Christian was just as much fun, it was the push over the cliff, so I resolved that I didn’t need church. Instead when I saw those people around campus I created stories in my head, I imagined they were judging my lifestyle and spreading rumours about me to exclude me further from the church. My whole image of the church was as a secluded club where only the really good people where welcome, only the ones who lived lives like Jesus. I believed this for many years. My friends, tried to invite me to church but I refused. My mother, tried to encourage me to go to church and find ‘a nice man’. I still refused. I was stubborn and rather than choosing to spread love, I chose to spread my obstinate opinions around. When my mother reminded me of this, I laughed. I can’t imagine ever holding that opinion now. Granted not all churches are the same, they don’t all fall into one category. But my whole view of ‘church’ has changed. I no longer have to cringe in guilt when I hear that name. Well first of all, I gave in and decided to open my mind and try going to a church, that church turned out to be Jesus Lifehouse Osaka. But before I go there, let me explain, the real reason is my whole view of the church has changed. This isn’t just because of Jesus Lifehouse but my whole idea of what a church should be has changed. A church isn’t just a building, it isn’t just a place for people to hang out, sing songs and get preached at… it’s a whole lot more than that. At the conference Pastor Steven Kaylor spoke about three components that make a church – GREAT! The first one is key – it’s what it is all about! Without it, you just have a group of people. It’s what the church should be centred around, we can’t forget this vital ingredient. The wonderful, powerful, loving, caring, awesome, close, relevant, original Jesus. In the middle of the church needs to be Jesus. The answer to everything is Jesus. It’s through Jesus that we can be the best person we were designed to be. With Jesus there is hope, with Jesus there is light. Our focus needs to be on Jesus, not on each other, not on our own mess or each others mess, but on Him. The second thing about church, is life. It needs to breathe life into all its members. It needs to live and speak life. In the bible there are many stories where Jesus healed people and gave them life. Jesus gave us life, but it’s how we use it that matters – the church can help us out with that. Pastor Joel, compared life to a car, we drive it wherever we want it to go, but living life, driving places, going somewhere always means gas is going to get eaten up, we are going to run out of fuel and energy, time and love. But Jesus has given us a great gasoline stand; he can fill us up with gas, give us love, peace, joy, passion and more vitality to live life! The church is like the gas station, it can do two things – change our life and equip it. We can have fun at church but it can also teach us how to live a great life, how to have great relationships, how to be successful in our careers, how to manage our money. Instead of getting dating tips from magazines, it can show us how to have a strong foundation in marriage. In church we can really grow and become the person we always wanted to be! The third thing Pastor Joel pointed out is that it’s a place for us to belong; it’s our house, our family. It’s not a substitute for the family we already have but it’s an extended family that can help us grow strong. A place where we are accepted, not judged, but loved and respected. Through Jesus we can be adopted into his family. This family will want to celebrate with us, help us in life – to create the best relationships, to have success, they will look after us and nourish us. Being in the house of God means that everyone cares about everyone! When I went to church at university I didn’t realise that it was these 3 things I was actually looking for. Jesus, Life and a House. There are a lot of churches around that embody these three things, but I didn’t believe that. Genuinely. Not only that, but they all were so full of love, Jesus love, that they couldn’t stop smiling and sharing their happiness with each other. I didn’t meet an unfriendly face. I had so much fun! I was welcomed into their arms! The other thing that made me take a step back was that all these people really wanted to grow, they wanted better lives, and they were taking action towards it. They knew the answer, Jesus. It was contagious to say the least. But from that day my view of church changed. Now I know that it’s not just a place where people want to make you feel bad or tell you that you’ve messed up. It’s not a place for judging or taking your money. Instead it really is a great place to make friends, have fun, find Jesus, revitalise your life and be welcomed into a family who accept you for you! If you don’t believe come down and see for yourself! Everyone has their own reasons for not going to church, but don’t let a bad experience put you off from trying again. Maybe you are like I was, you believe in Jesus or a God, but you don’t think you need to go to church to continue believing in Him. When I was not going to church, the more I refused to go, the further away from Jesus I got. In the end my relationship with him was pretty non-existent. Really I stopped believing all together, I didn’t need Jesus, I thought. Then my life became pretty dire, because the thing was I did need Jesus and I did need people to encourage me in my faith. We can’t do it on our own, but we can do it with Jesus and other people who will spur us on to be more than what we imagine to be, to help us grow and live the best life we can. Whatever your reasons are for not going, why don’t you put them aside for just a minute and give it a go! 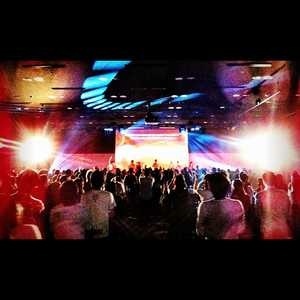 Come to Jesus Lifehouse Osaka! The people are so lovely, the music is awesome and the message will change your life! 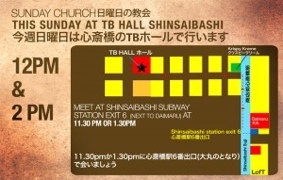 We are in Shinsaibashi on Sundays, and in Namba on tuesdays! This week there was a big conference in Japan. By bus, or by Shinkansen, by foot or by bicycle, by aeroplane or by subway – they came. In flocks, In herds, and singly they dispersed, from every different region. To Tokyo. they filled a room with their voices, with drums, guitars and keyboards they made noises. They listened and they learnt and from them dreams burst forth. From tiny bubbles, came big bubbles, full of visions and dreams, of things they could never imagine of things they had never ever seen. That conference was the Jesus Lifehouse Conference. I learnt so much, laughed, cried, met people from all over, made incredible friends, and fell in love with Japan even more. Words cannot describe what I received this weekend. My vision for Japan, my vision for Osaka, my dreams – went from one small bubble to this… an endless stream of vision and passion that just wanted to blow up out of me. Many people I spoke to also say the same, their vision for Japan has heightened, to see Japan change, to see people’s lives built up. It was amazing to see so many people gathered in one place, from all over Japan and from different parts of the world. Well over a 1,000 people were there all with the same vision – to see Japan change. Many people were challenged this weekend. Challenged to dream large, to not be afraid to dream big, bigger than we can imagine. But I realised, there is only one key to all of this, to all the dreaming, all the visions all the change we can make in Japan. All of the pastors there spoke about many different things, and spoke about many areas in life, that challenged us. But no matter what they spoke about it could all be drawn back to one thing. The key. Brendan Brown from hillsong Sydney challenged us to question what are we looking at? There are so many things that want to get our attention in life. For everyone, even Christians. In the billboards at the train station, the pretty girls in the magazines, the celebrities on TV, the boys at school, or work, or in the clubs. The music, the movies, the drink and the parties. How we should look, how we shouldn’t. Where we should go, where we shouldn’t. What we should do, what we shouldn’t. It’s all trying to grab our attention, trying to fix our eyes on the next best thing, trying to tell us this will make us happy. But no matter what we are looking at, we need to fix our eyes on Jesus. He is the only thing that is going to make us truly happy. The only one who can give us an answer. We are human. Even Christians. We have eyes. And most of us can see. Which means we are always looking for something to make our situations better than they are. We look around us at others – comparing ourselves to models in magazines, celebrities on TV, or even to our best friend, who is popular and gets all the attention from guys/girls. But we don’t need to be comparing ourselves all the time. The best person we can be is us. YOU. Then when we are not looking at others we are looking at ourselves. We turn to the horoscope page at the back of the newspaper, or find ourselves wondering in the self-help section at the book store. We read magazine articles on how to make a guy want us, or 10 tips to making ourselves more attractive. Even when we know they aren’t really going to help us, or change our lives we still flick through and wish they could. The thing is, when we are looking at others, when we are looking at ourselves, we are forgetting one thing, Jesus. Jesus came to earth and died for us, so we could have a great life, he didn’t die so we could go about finding the best life we can in a horoscope on the back of a cereal box. When we are getting all bogged down in our problems, the things going wrong in life, the mess, mess, mess, it’s because we have taken our eyes off Jesus! If we fix our eyes on Jesus, he will make us the best we can be! Why would we want anything less than that? All those questions we have, all the things we search for in life, everything we are looking at. There is only one answer. Jesus. Next time, I will talk more about the challenges I received from the conference, so please continue to read. But in the meantime, if this has challenged you, if you feel God is calling you to question what you are looking at, or if you have never heard of Jesus and want to know more about him, come to Jesus Lifehouse Osaka. We can introduce you to Jesus, help you to stop focusing on the mess around you and help you to find the best life through him! 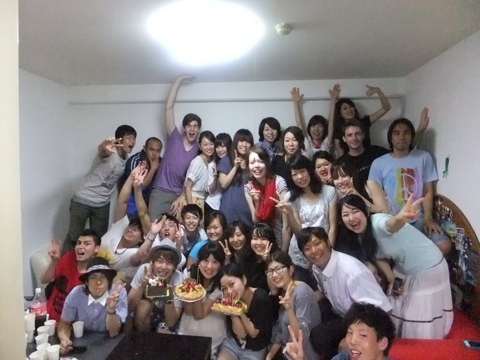 We will also share with you our passion for Japan, and our love for people. So come on down and see! We are located in Shinsaibashi, near Krispy crème donuts, so you can pick up a donut on your way! What could be better? I want to talk to you a bit more about myself and how I came to Japan. When I first came to Japan, I didn’t expect to end up where I am now. Actually I had only planned to come for 6 months, become fluent in Japanese and then leave to go back to my own country. Either that or fall in love with some Japanese dude, get married and have lots of half Japanese babies. Actually none of these idealistic notions ever happened. I didn’t become fluent in Japanese in 6 months, I didn’t get married and I didn’t leave the country either. Instead, the best thing happened. I fell in love with Japan. I ended up staying here for a lot longer than 6 months and finally after going around and around in circles looking for direction in life, I found myself at Jesus LIfehouse Osaka. This was where I rededicated my life to Jesus, this was where I could really steam on ahead in life. But let’s go back a few steps. Thing’s haven’t always been so hunky dory! I grew up in a Christian home, I accepted Jesus love for me in to my life when I was 13 and I really wanted to live for him, but by the time I reached 18, parties, boys and the list of 1001 things I hadn’t done in my life arrived at my door… Suddenly I wasn’t so sure if following Jesus was the way forward in life for me. I was suddenly compelled to rebel. The foundation I had in Christianity wasn’t based on God, it was based on my families’ moral values and beliefs and it was against them, that I suddenly found the need to fight back. whirl wind romance with life, everyday leading to some new exciting venture and every morning to a hangover from hell, topped with a plague of guilt that I wasn’t following my dreams and I wasn’t living up to the person I imagined I would be. In fact I wasn’t living for anything, but myself. It wasn’t that I didn’t believe in God, but more than that, I didn’t think I needed HIm in my life. There wasn’t any ROOM for God in my life anymore. What could God give me that I couldn’t get myself? I had been introduced to alcohol and freedom, I could do whatever I wanted, whenever I wanted. I was allowed to lose control and was encouraged to do so, my friends acknowledge that this ‘Party Laura’ was so much fun. The more they acknowledged it, the more I wanted to live up to the gregarious name I had set up for myself. I totally forgot about God. I had totally left him behind. Actually I was just running away. Running away from life. or even what running shoes you’re wearing, you can’t run away from life. When I arrived here I had every intention of making something of my life, leaving behind my selfish ways and taking up a challenge that would give me a new direction. wooaaaa…….. It was like someone had pressed the pause button on my “Journey to ‘life'” I was stuck in commercial mode. A crazy, constantly moving, commercial. Life in Japan didn’t stop. There were lights and food and customs I was totally unused to. Karaoke, Izakaya’s, boy’s – people just wanted to talk to me all the time, I was the interesting white Gaijin, I loved it. For the first 6 months I lived it up, it was all a novelty, I got lost in the commercial island that Japan had marked in my life. Gismo’s galore. It was great, it was fun, it was everything I wanted Japan to be. But after a while things started to take a negative turn. The small things about Japan started to irritate me, I became down about living here, but it wasn’t just about Japan – I was down with life. I had no purpose, no goals, I had a deep longing to be something more, to live more than just me, but all I was left with was a deep un-satisfaction with what I had. I didn’t know where to turn, or what to about it, so I just carried on how I was living – in a mess. I gave up in away. At this point in my life it reminds me a lot of a story in the bible that Jesus told, about a son who decided to leave home with his father’s money and go off and find his own life. He lived it up, he had a blast, until his money ran out and he found himself feeding pigs. He realised even his father’s servants were living a lot better off than he was. He couldn’t do it by himself. Granted, I wasn’t exactly feeding pigs, but I was totally lost in life, I thought I could do it all by myself, but I couldn’t even take care of how I was feeling inside. I was a long way from home and alone. At first, I had blamed Japan for how I felt. But it wasn’t Japan’s fault I felt this way, it wasn’t Japan’s fault that I couldn’t get more from life, it wasn’t Japan that was making me empty inside. And although I didn’t realise it at the time, my frustration wasn’t at Japan it was at myself. I thought I needed to leave the country and explore somewhere new to find the answer. But running away is never the answer. I had runaway to Japan I couldn’t run away from it. I had to sort me out here. So I did. Even at this low point in my life, I knew what was missing, I knew what my heart was longing for…. Now, my life is Great! It’s so satisfying! I have so much joy and hope for an amazing future! I’m filled with vision and purpose for life! 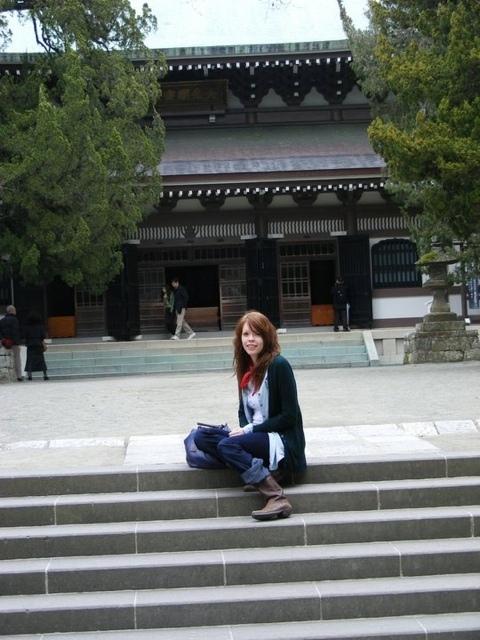 For most of my time in Japan, I made pretence to my family and friends that my life was great. I had this amazing career, living in Japan, learning and speaking Japanese, teaching kids which I loved, but the truth of the matter was, I had lost all the excitement and joy this life could have brought, I was empty inside and I had lost hope. Six more years down the line where would I be? I didn’t want to be 30 years old and still carrying on this dead end party lifestyle, which could never really fulfil me in anyway. I made a declaration to myself then and there. This was my life, I was the only one who could make a difference in it, I was the only one who could start the change. But I wasn’t exactly sure how?! One Christmas I went back to visit my family, in England, I drank away my shame as I saw my friends and family getting on with their lives, starting families, finding loved ones and not letting their insecurity take over. What had I got to show for my life, it finally dawned on me, not a lot. When I got back I vowed I would change myself, I had already started living healthier, and trying to find my spiritual self, albeit down the wrong alley. I had written a list of things I wanted to accomplish in life, or in that year at least, I wanted to learn Yoga, write a novel, become fluent in Japanese, make more friends, read more, the list went on and somewhere down at the bottom I had written ‘Go to church’. I don’t know what had inspired me to write it, maybe my mother’s constant nagging had finally gotten the better of me. But there was that calling in my heart. Despite trying to do a lot of these things, none of them really fulfilled me, my own soul was nagging away at me to do something more. So one day after spending the whole weekend locked in my apartment by myself, I searched on the internet for a church, what harm could it do, I could just go, if I didn’t like it I could leave and never have to go again. Maybe I would meet a few people, I certainly wasn’t meeting any sat around here. So I searched and I found Jesus Lifehouse Osaka, not far from me. The website looked really appealing and friendly and modern, I was suddenly filled with a surge of excitement and eagerness, I was going to go to this church, I was going to meet some new people, I wasn’t nervous like I thought I would be, instead I was on the edge of my seat in anticipation. I didn’t understand why I felt so excited to go there or why I was so adamant that I would, but that week I just couldn’t wait to go to that church. daughter back home. From that day God’s spirit and love started filling up inside of me, the hole in my heart that I had been trying to fill with alcohol and men was being replaced with a purity that I thought I could never get back. The day I went back to church, I broke down inside. I realised that all my efforts and energy I had been putting into making my life better were fruitless without God’s help. I couldn’t do it by myself and I didn’t have to do it by myself! Remember the story Jesus told of the lost son, well the end of the story goes like this. I was like that son, I had gone my own way, got totally lost, lost hope, lost satisfaction and was pretty much losing out in life. It was only at my darkest point did I turn back to God and realise, I can just go home to Jesus. He wants me back in his life, it’s what he longs for most. After everything that I had done, I felt ashamed and stupid – I was not worthy, I thought, to even be considered a Christian, so I ran further away from any kind of good thing in my life. But on this day God made me realise I am WORTHY. That day God wiped my plate clean, as if all the points on my drivers licence were suddenly irrelevant, I was given a new chance and I wasn’t going to give that up. He welcomed me back with open arms and filled me with love and joy, he gave me more compassion than I could ever comprehend. My heart had become cold towards love, towards my family, towards acceptance by others, BUT now I have a renewed heart filled with love that I can’t stop spreading. Because of this my life has changed in more than words can say. I met many people that day, they surpassed all of my preconceptions and false apprehensions I had been carrying around towards Christians. They were all people just like me, who had stuffed up, who had smoked and drank and abandoned themselves to their insecurities, they were not perfect and they needn’t have been because God had chosen to love them all the same. God shone through them like I had never seen God shine amongst his people, they accepted me warts and all, they didn’t judge me, but wholesomely wanted me to be a part of them. 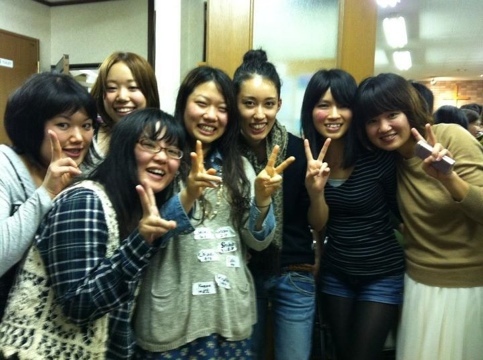 They had vision and purpose in their life to change and be a part of change in Japan! And I thought to myself, these are the people that make the world worth living in, I wanted to be like them and I wanted to be a part of them. From that day I did become a part of Jesus Lifehouse Osaka, I became a Christian again just like them, I learned to give my life, not just take it. But more importantly I let Jesus back in and letting Jesus into my life will always be the most life changing thing I have ever done. Maybe you like me have got lost in life, or don’t really know where you are headed. It can feel hard and tough; we don’t know all the answers. But there is hope and joy to be found. It’s not difficult and we don’t have to go on a pilgrimage to find it. We just have to turn to Jesus. He is waiting for us arms wide open. He is not going to tell us off or make us feel guilty, he is just going to welcome us back home, into his arms of love, fill the hole in us and restore our hearts. And then he is gonna CELEBRATE! Maybe you are unsure about church and the whole Christianity thing, I was for 5 years! I ran as far away from it as I could and for 2 and half years whilst I lived in Japan I was adamant I didn’t need to go to church, nor did I want to. But once I built up the courage and went, my whole life changed around. Now I really can believe it when I tell my family, I am living the best life ever – because I am! So why don’t you come on down and see for yourself, even if it’s just to meet some new friends, I guarantee you will have a good time!